You can donate to Tabby’s Place here. I only just read this; I am so sorry about Sparkle. That cat touched many lives and that way had many more than 9 lives. What a wonderful idea. So sorry for you loss. So sorry to hear of your loss. 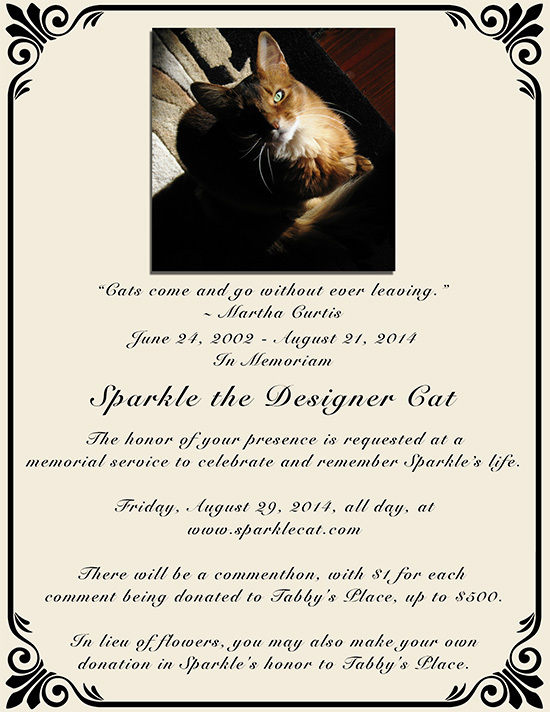 Very beautiful cat and touching gesture in Sparkle’s memory. I’m sorry for your loss. Thank you so much for donating to Tabby’s Place in memory of Sparkles. I can’t think a better way to honor a loved one. So sorry to hear about Sparkle’s passing. Now my heart is broken all over again. We will be checking in, absolutely, and hoping that others who are employed and more fortunate financially will give generously to Tabby’s in tribute to HRH Sparkle, a tireless advoCATe for cats less fortunate. It’s a great thing you’re doing to help a lot of cats. Good going! 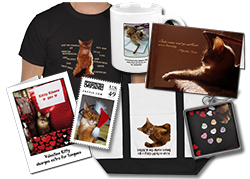 Sparkle – you will always be a kitten now and you will never be forgotten. Wonderful idea… have been thinking of you. Hope you’re ok.
Will will be at the service and you are in our thoughts today and every day sweet girl. We will be by fur sure. We support this great rescue for those who really may not have any other alternative. Mom’s eyes are leaking again. We will be there–and donate, too! What a lovely thing to do for Tabby’s Place. Sparkle would approve. We will for sure stop by…such a lovely thing to do in honor of Sparkle. We’ll be there, Summer. Thanks for coming by to visit us. We posted it on our blog tonight too. Spread the word. Poor Sparkle. We will miss you! 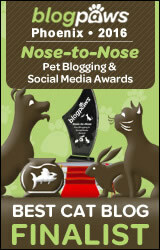 â€Siamese Smothers and Tuxie Ticklesâ€ from Mikko and Jax at Happiness is Siamese! PS: We contacted you, we hope you got the email. If not then could you please let me know? We wouldn’t miss it, Summer. Count us in Summer! We will be here Friday and donate our green papers too that day in amazing Sparkles memory. We’ll be there and hope you are taking time to care for yourself. What a wonderful way to turn an awful loss into a gain for the kitties at Tabby’s Place- Sparkle would have approved. That’s absolutely perfect! Sable Cat and I are in! I’ll mark it in my calendar. Thanks for the invite. Oh, Sparkle…we will certainly be there…how we will miss you. Thank you for all the years……..we wish you a safe passing to the rainbow bridge…..
We’ll be there with catbells on! a lovely way to pay tribute…. We’ll be over to remember and to donate too. How wonderful. The publicist is happy to make a donation in Sparkle’s honor. Oh, I will not be forget this!!! !